The official symbolism is: The pink flower surrounding the ying and yang symbol is the rose of Sharon, the Korean national flower. 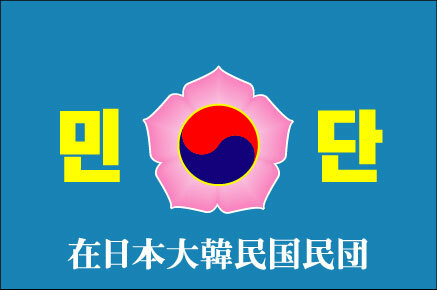 The formal name of the society is written in Chinese characters in white, which Japanese can read as well, and the abbreviation (Mindan) is written in Korean characters in yellow. The blue field of the flag stands for clear sky and sea.